Saw an old friend from the ‘hood yesterday who recommended these natural massage oils. Since I have “home-service” massage once a week, I gave it a try. It’s all organic so no worries that chemicals, carcinogenic or otherwise will harm your body. The Massage Oil I bought had Virgin Coconut Oil, Olive Oil, Pepermint and Orange oils, with the soothing aroma of lavender. Very reasonably priced at P115 for a 50ml bottle. The masseur liked that it kept its oily consistency so he didn’t have to keep adding on oil as it dried. I like that it was absorbed by my skin so it didn’t feel greasy afterwards. Then there’s the Massage Rub Cream with peppermint and ginger, which is a natural liniment that heats up the body. Ideal for “hilot“‘or massage that relieves muscle pain or stiffness. 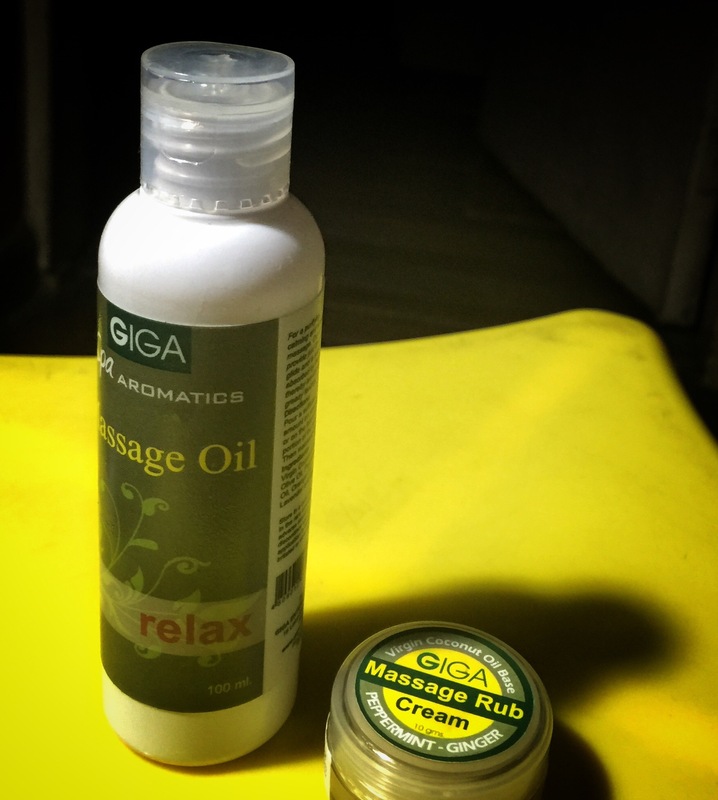 For my backpain, my masseur mixed the Giga Oil with the Rub Cream. It worked wonders on healing my aching muscles. Maginhawa talaga! Available at the Giga kiosk in Glorietta near McCafe. Also in several SM malls.